On Monday the Smithsonian Institution launched a Kickstarter campaign to preserve astronaut Neil Armstrong’s Apollo 11 spacesuit. Now with over $420,000 raised and a healthy 26 days left, the campaign is on track to easily exceed its $500,000 goal. But the Smithsonian’s road to crowdfunding success has been a long and bumpy one. Update: July 24, 1:40pm: The campaign just reached its goal. Everyone’s first question seems to be why America’s most famous group of museums (yes, the Smithsonian actually consists of 19 different museums and galleries) would need to raise money through Kickstarter in the first place? The most straightforward answer is because federal funding only covers about two-thirds of the organization’s budget. The Smithsonian sees Kickstarter as just another avenue for private donations. One of those new sources has been crowdfunding, albeit with only limited success. The Smithsonian has tried crowdfunding different exhibits three times in the past. And each attempt has posed its own problems for the institution and contributors alike. In 2011 the Smithsonian got a lot of heat for an exhibition called The Art of Video Games. People could pony up $10 to play games on the Smithsonian’s website and anyone could vote on what video games would be included in the exhibit. They raised just a few thousand bucks and ultimately, the exhibit suffered from “the madness of too many cooks” as one commentator called it. Most video game critics saw the whole endeavor as a big miss, with major omissions and poor curation. Then in 2012, the museum tried raising money for an exhibit showing off the work of Chinese dissident Ai Weiwei. The museum used a website called Causes and they raised just $555 of their $35,000 goal. The exhibit happened anyway, but it was a pretty embarrassing experiment in trying to fund a project. In 2013 the Smithsonian finally found financial success with their newest campaign, but still didn’t quite nail the crowdfunding formula. They launched a campaign for an exhibit called Yoga: The Art of Transformation. And while it exceeded its goal of $125,000, ultimately raising over $175,000 for the project through Razoo, there was one small hitch: None of the over 600 people who donated money saw anything for it. While there’s nothing wrong with merely asking for donations, the ethos of modern crowdfunding generally dictates that people get something for their donation — even if it’s just a tote bag or a poster. That all seems to have changed with the Smithsonian’s latest Kickstarter campaign, Reboot the Suit — their first with the biggest name in crowdfunding. They’re raising tons of money, they’re offering rewards at a wide range of levels, and they’re making people feel connected to the project in a way that previous crowdfunding efforts have lacked. This current effort is certainly different for the museum, as Yoonhyung Lee explains. Just a few days into the campaign they had to add more reward levels and and increase quantities for existing rewards, because Reboot the Suit had become so popular. 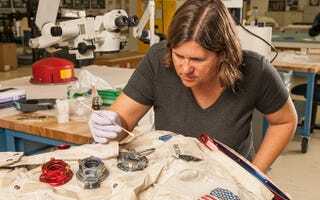 But there’s something more than just rewards at work with a project as important as the preservation and display of Neil Armstrong’s spacesuit. In that spirit, the Kickstarter campaign starts at a dollar. And of course the rewards are more humble at the lower levels, but even those are pretty cool. “We wanted to make sure that people were receiving rewards that were really special and unique. For example, Michael Okuda who is a designer for Star Trek and for NASA, designed the mission patch that we’re offering for Reboot the Suit, which is absolutely amazing,” Lee says. Kickstarter is just one more tool in the Smithsonian’s fundraising toolbox. Five or ten years ago, the Smithsonian would have been reliant on more traditional fundraising channels, including corporations, grants, private donors and sales of memberships. And those channels aren’t going away. There’s just a subtle yet vital shift going on here, now that the Smithsonian seems to have figured out the best crowdfunding formula. Sites like Kickstarter open a door for a new kind of engagement with the public for preservation and exhibit projects. It may have taken some time to get right, but the Smithsonian, like everyone who’s experimented with crowdfunding, has clearly learned some lessons on best practices. And with any luck, they’ll be able to use them in future fundraising endeavors.